Kilimanjaro in partnership with The Royal Hospital Chelsea is proud to announce ‘Live At Chelsea’, a very special concert series at the Royal Hospital Chelsea, the historic home of the Chelsea Pensioners. This is the first time that a concert series has been staged at this very special venue; the shows themselves will take place in a fully seated auditorium in the Royal Hospital Chelsea’s central courtyard. The Hospital was founded by King Charles II in 1682 and is home to the Chelsea Pensioners, 300 ex-Army servicemen and women. Major General David McDowall CBE, Lieutenant Governor and Chief Executive Officer of the Royal Hospital Chelsea, said: “We are very much looking forward to welcoming music fans into the Royal Hospital Chelsea this summer, especially those who have not visited this historical home before. Friday June 12th sees Rufus Wainwright perform at Live At Chelsea, Rufus has established himself as one of the great male vocalists and songwriters of his generation working in the world of Opera as well as collaborating with artists such as Robbie Williams, Elton John, David Byrne, Boy George, Joni Mitchell, Pet Shop Boys and producer Mark Ronson. The following night Irish singer songwriter Damien Rice will perform his only London show of the Summer in support of his hugely successful third album ‘My Favourite Faded Fantasy’ his first new release in eight years. 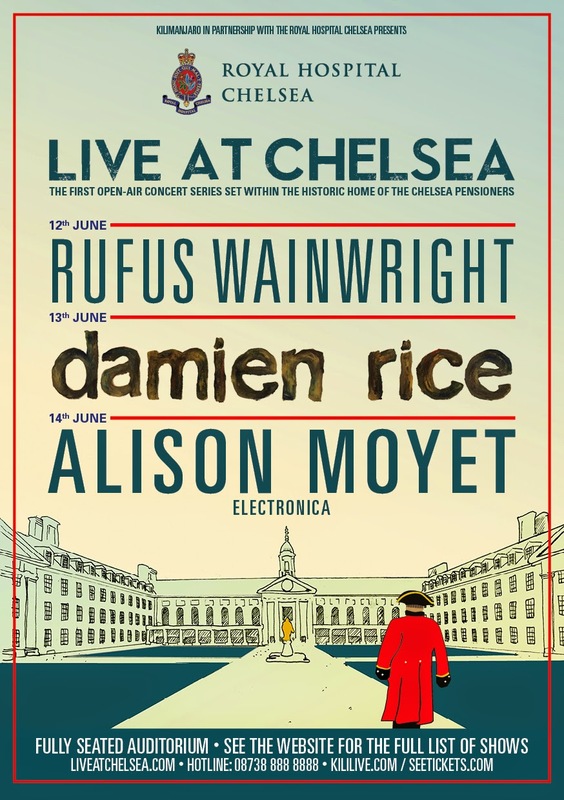 The final Live At Chelsea show for 2015 on the 14th of June will feature Alison Moyet. Alison returned to her electro roots when she released her eighth solo album ‘the minutes’ to critical acclaim in 2013, followed by the live album ‘minutes & seconds’ in 2014. This gig will place ‘the minutes’ centre stage and focus on the significant electronic material in her back catalogue.